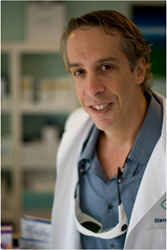 Dr. Steven Weiner uses state-of-the-art PRP collection and injection techniques that have shown hair density improvements ranging from 12%-63%. His office, The Aesthetic Clinique, is located in Santa Rosa Beach, Florida, between Destin and Panama City Beach, Florida. Using Injections with PRP, which contains numerous growth factors FROM YOUR OWN BLOOD, Dr. Weiner is able to stimulate older hair follicles to produce thicker and more dense hair. PRP is “Platelet Rich Plasm,” a portion of whole blood that is separated from the red blood cells through centrifuging. It should contain concentrations of platelets that are at least 4 times that of what is found in whole blood to get the maximum benefits. Its use in medical conditions started in the 1990′s mainly by Orthopedic Surgeons, Dentists, and Oral Surgeons, but has recently been expanded to the Cosmetic Surgery arena. PRP use in hair restoration began during hair transplantation 5-7 years ago. Surgeons found that bathing the harvested hair follicles led to improvements in the “take” of the transplanted follicle as well as more hair growth, and denser hair growth. Injecting PRP in the harvested area led to improved healing of the scar. It was then discovered that when PRP was then injected into areas of hair loss without transplanting hair, that there was new hair growth. Adding ACell (a derivative of porcine bladder) and Vitamin D3 and B complex gave even further improvements. In a study published in “Prime” Journal, patients were found to have improvements in their hair growth from 12-63%, and notably, there was improvements in all the patients studied. Growth seems to start at about 4 months, and starts to fade at about 11 months. Improvements are more dramatic in females than in males. The mechanism proposed for the improvements seen is that the PRP leads to increased vascularization of the hair follicles, leading to a “waking up” of previously poorly perfused hair follicles. The growth factors also stimulate the hair follicles to produce hair. Interesting findings have been thickening of hairs that have been growing but have miniturized (become thin). It will not cause hair to grow in areas of scarring or in areas where there was never hair. It’s also been found that new hair growth is sometimes pigmented in areas where hair had turned gray, representing a “youthful” follicle. Recommendations are for at least one treatment yearly for females, and 2 for males. Topicals such as Rogaine or Propecia should be continued. The process starts by drawing blood, 60-120cc. It is put in the Magellan processor to separate the PRP, which takes about 15 minutes per 60cc of blood. During this time, the scalp in numbed up with both topical creams as well as injections. When numb, the scalp in injected with the vitamin and mineral mixture as well as with the ACell solution. The PRP injection in then performed. The final process is using the Dermapen microneedling device to create very fine holes in the scalp. A by product of the Magellan PRP system is “PPP” which is platelet poor plasma. PPP has growth factors, but to a lesser degree than PRP. This solution is spread on top of the scalp and will be left there overnight. Washing the hair can be done the following morning. Sometimes extra PPP will be given to the patient to apply to the scalp at home. The total in office time is about an hour or an hour and 15 minutes. A second treatment (for men) is scheduled at 2-3 months. Dr. Weiner is a Facial Plastic Surgeon who laid down his scalpel in 2005 and concentrates solely on noninvasive and minimally invasive Cosmetic Procedures. He is Johns Hopkins trained and Board Certified.